Polar Bears Survived the Ice Free Arctic | Watts Up With That? UPDATE BELOW: Peer reviewed science supports the title! That must mean it is OK to take Polar Bears of the endangered species list. But the decision to put them on the list never had anything to do with science anyway. The other implication of Dr. Meier’s statement is that a warmer, ice free Arctic occurred when CO2 levels were less than 290 ppm. This implies that there is no long term correlation between CO2 and Arctic temperatures. Conclusion: There is no evidence that Arctic warming over the last 30 years has anything to do with CO2. If it were CO2 causing it, we would see warming at both poles. An ancient jawbone has led scientists to believe that polar bears survived a period thousands of years ago that was warmer than today. Sandra Talbot of the U.S. Geological Survey Alaska Science Center in Anchorage was one of 14 scientists who teamed to write a paper based on a polar bear jawbone found amid rocks on a frigid island of the Svalbard Archipelago. The scientists determined the bear was an adult male that lived and died somewhere between 130,000 to 110,000 years ago, and that bear was similar to polar bears today. Charlotte Lindqvist of the University at Buffalo in New York was the lead author on the paper, published in the March 2010 issue of the Proceedings of the National Academy of Sciences. July 15, 2010 in Alarmism, Arctic, Paleoclimatology. Surprise, surprise! Who’d a thunk it? That is a wonderful graph illustrating things perfectly in my view, although I don’t like suppressed zeros at any position. The (lack 0f) common sense, logic, & contradictions of AGW are truly depressing. OT, on yet another BBC prog about wildlife they had a member of the RSPB talking about Falcons. He couldn’t resist weighing in with the clearly well rehearsed FACT about DDT causing eggshell thinning thus reducing the birds ability to reproduce, explaining the low numbers in the 20th century! However he omitted to point out to the largely ill informed public that numbers were in substantial decline from the mid 19th century, long before DDT was produced for mass agricultural use, but hey, never let a real fact get in the way of a good eco story! Now, where have I heard that claim before???? Are yes, Ms R. Carson I believe, & the RSPB has been “on message” right from the start. If it were CO2 causing it, we would see warming at both poles. Thus global warming is a northern problem. This explains why the Antarctic isn’t warming and saves the AGW theory from oblivion. That and controlling the committees that investigate the scientists doing the science, when they’re caught admitting to grievous fraud and intimidation of non-conforming peer reviewed scientific journals. See how that all works? Some of the strict items which must be checked is that numbers are low, are declining and that breeding is happening at an insufficient rate to increase the numbers without additional protection for the species. In the case of the Polar bear, this is not happening as their numbers, far from declining, have increased five fold over 60 years. Another interesting fact is that peoples are allowed to hunt Polar bears, and there is no way in hell that this would be allowed to happen to any species listed on the endangered species list. The polar bear IS listed on the “threatened” species list. This is a totally different list with a far looser set of criteria. The ONLY reason that the polar bear managed to become included on the threatened species list, is because this list did not take into account current conditions, but accepted the potential, predicted conditions that the Polar bear MIGHT encounter, according to climate alarmists, in future years. This means that the entire biosphere and all individual species should be on the list too. Recent study looking at Climate and culture in China suggest things get worse when things get cold! Polar bears in the Hudson Bay area of Canada are likely to die out in the next three decades, possibly sooner, as global warming melts more Arctic ice and thus reduces their hunting opportunities, according to Canadian biologists. http://e360.yale.edu/content/feature.msp?id=2293 so the proposal that Polar bears are threatened by a decline in Arctic ice has been supported. As for what happened thousands of years ago, maybe not all sea ice disappeared or the population became very small then flourished when Ice returned, who really knows and is somewhat irrelevant when there is concrete evidence of Polar Bear reliance of Arctic sea ice now. “Ongoing concerns about the plight of polar bears becoming victims of climate change are now heightened with the release of a paper that has three University of Alberta researchers among its authors. Peter Molnar, of the U of A’s Centre for Mathematical Biology, and university professors Andrew Derocher and Mark Lewis, used mathematical modeling to show polar bear populations could plummet if ice-free periods in the Arctic continue to increase. “Mathematical modeling is a quantum leap forward in our understanding of how climate change will affect these animals,” said Derocher. The research team assigned numerical values to study how long male polar bears located on land near Churchill, Manitoba can go without food when they’re cut off from their hunting grounds on the sea ice of Hudson Bay. “Thanks to previous studies researchers know the weight and energy storing capacity of polar bears and the warming trend in the North is well documented. “We know climate change has increased the ice-free period in Hudson Bay by three weeks over the last three decades,” said Derocher. “Records also show that since 1990 ice-free periods in Hudson Bay vary from 90 to 135 days and that the current polar bear mortality rate is around three per cent. With climate change, predictions indicate that the ice-free period will increase. “Derocher has real concerns for the 900 polar bears in the study area. “If the ice-free period extends to 180 days our modeling shows upward of half of those animals will die.” An important finding is that the changes could happen very quickly and this contrasts with the slow decline in polar populations that have been found to date. “Accounting for the changing efficiency of males finding females, Derocher says the team concluded the pregnancy rate could drop by 30 per cent. “…The significance of the new study is that it is based on a mathematical model which matches the weight and energy-storing capacity of the bears, which are known – the west Hudson Bay animals are the most closely observed of all polar bear populations – against the annual ice shrinkage and the time they have to spend on land without food. And by the way, COULD the Canadian taxpayers please send us some more of that lovely global warming money which COULD be running out because, IF our mathematical models are correct, we COULD be completely cash-free by the end of this financial year. “…Alberta is often best known for its energy resources, and U of A faculty and alumni have played key roles in developing Alberta’s black gold. AGW research thinking is completely cracked. They accept money from their enemies and their supporters at the same time. They also say nature is all-powerful, and then go on to produce a headline such as “Michael McCarthy: The symbol of nature’s battle with climate change” http://www.independent.co.uk/opinion/commentators/michael-mccarthy-the-symbol-of-natures-battle-with-climate-change-2026756.html which must be one of the stupidest headlines I’ve seen this year. Nature is nature, it’s natural, that’s the point; it doesn’t “battle” with anything. I find it rather interesting that there has been no worry about the fate of Alaska’s Kodiak bears — the largest brown bears in the world. Of course, these animals have fully demonstrated that they can take care of themselves. I am planning to point my students to this website – and this thread in particular – as an excellent example of a logical fallacy ‘in the wild’. You can all help out by not mentioning what the fallacy is in the comments, otherwise you will give the game away, so to speak. Unfortunately the RSPB is now just another fraudulent cAGW alarmist group. They get a £10 kickback from Big Wind every time they get one of their bird spotter members to sign up to one of the “Green Energy” electricity suppliers. And (of course) say nothing about the thousands of birds per year that get shredded by wind generators. And then you get another mainstream UK Charity (OXFAM), set up to combat famine, spending tens of thousands before Copenhagen 2009 with highly alarmist billboards all over the UK. And, if you check, yes they are in favour of biofuels that have increased famine in the third world. Spot on the DDT scare story. Rachael Carson did everyone a big disservice by misrepresenting the science of DDT. Talked about in the wonderful book Kicking the Sacred Cow. A must read for everyone interested in the interplay of science and politics. Modern science is not the popular image of geeky types sacrificing normal social lives to pursue the ‘truth’. It has become a bureaucracy with funding and status issues. Sometimes it works the way it is supposed to, but mostly it is about people trying to hold onto jobs in a culture of groupthink and government funding, with all the strings attached. Rachel Carson is one of the primary saints of environmentalism. How appropriate the so-called science underlying her assertions are false. The ban on DDT is a glaring example of government ignoring the science due to an ill informed public pressuring their representatives to ‘do something’. AGW research thinking is completely cracked. They accept money from their enemies and their supporters at the same time. When money speaks, no one minds the accent. I got the chance to talk with a hunting guide from the Hudson Bay area a couple of years ago. I asked if he had noticed anything about the climate and its effect on polar bears. He said the rivers do experience an earlier thaw and later freeze. He also said many polar bears go inland to eat caribou. Makes sense. Bears are bears. If one source of food dries up, they go after another. One of the wolf packs in the Lamar Valley region of the Yellowstone specializes in bringing down buffalo. They eat well, they also leave a big pile of table scraps. Or more accurately, they can’t eat the carcass fast enough to prevent its theft by a grizzly bear. As a result, grizzly bears are better fed than in times past. One nature photographer captured a picture of over ten bears sharing a buffalo carcass. Unheard of a few years ago. Not enough food to share. But there they were, wrapping up a shared meal courtesy of the Lamar Valley wolf pack. These are good times for the grizzly in Yellowstone. Amazing what happens to animals and ecosystems when we leave them alone. Well, that’s half right. If that were a true statement, then we’d see a decline on the rest of the Polar bear population. We don’t. Or maybe Hudson Bay Polar bears are a special type unique unto themselves and don’t behave like the rest of the Polar bear population. It’s not like the Hudson Bay bears are a substantial portion of the total polar bear population. Here’s what has been proven. We have a decline of the Polar bear population in the Hudson Bay area. We have receding Arctic ice extent, but not confined to the Hudson bay area. That’s not even a true correlation, and no where is causation proven. Currently we have a population drain in western Kansas. Is anyone postulating that recent global temp rise is killing western Kansans? I don’t know why not, it is the same rationale. Actually the virtual extermination of peregrines (and many other birds) in parts of Europe and North America in the 1960’s by pesticide poisoning (DDT and mercury compounds) is very well documented and the physiological mechanisms are well understood. I was present when it happened and you could find droves of dying birds during sowing where mercury doped seeds were scattered about. Any number of birds and eggs were analysed and the connection between high quantities of DDE and/or organomercury compounds and the characteristic symptoms was verified by feeding experiments. There is no doubt that polar bears have survived, but what they had to “go through” to survive isnt clear. Obviously there is no point in extrapolating to the whole population from a few recent observations in one place about them “being affected” by reduction in ice, and I tend to agree with our Inuit friends mentioned above in the comments “It makes the south – southern people – look so ignorant”. Since this post is about “ice-free” conditions in the Arctic I draw attention to a recent scientific publication covering this (naturally using the current jargon of proxies and forcing). It amounts to a warmist co-opting/rewrite of palaeoclimate evidence as support for the position that were are in a completely new, unprecedented, situation. But it cannot be avoided that (see abtract below) “Early Holocene summer sea ice limits were substantially smaller than their 20th century average”. Abstract/reference below (full article protected by copyright limitations). the Greenland Ice Sheet, and even it was reduced in size substantially from its present extent. With the loss of land ice, sea level was about 5 m higher than present, with the extra melt coming from both Greenland and Antarctica as well as small glaciers. The Last Glacial Maximum (LGM) peaked ca 21 ka ago, when mean annual temperatures over parts of the Arctic were as much as 20°C lower than at present. Ice recession was well underway 16 ka ago, and most of the Northern Hemisphere ice sheets had melted by 6 ka ago. Solar energy reached a summer maximum (9% higher than at present) ca 11 ka ago and has been decreasing since then, primarily in response to the precession of the equinoxes. The extra energy elevated early Holocene summer temperatures throughout the Arctic 1-3° C above 20th century averages, enough to completely melt many small glaciers throughout the Arctic, although the Greenland Ice Sheet was only slightly smaller than at present. Early Holocene summer sea ice limits were substantially smaller than their 20th century average, and the flow of Atlantic water into the Arctic Ocean was substantially greater. As summer solar energy decreased in the second half of the Holocene, glaciers reestablished or advanced, sea ice expanded, and the flow of warm Atlantic water into the Arctic Ocean diminished. Late Holocene cooling reached its nadir during the Little Ice Age (about 1250-1850 AD), when sun-blocking volcanic eruptions and perhaps other causes added to the orbital cooling, allowing most Arctic glaciers to reach their maximum Holocene extent. During the warming of the past century, glaciers have receded throughout the Arctic, terrestrial ecosystems have advanced northward, and perennial Arctic Ocean sea ice has diminished. Pleistocene transition, warm interglaciations of marine isotope stages 11, 5e, and 1, the stage 3 interstadial, and the peak cold of the last glacial maximum. Hudson Bay polar bears are only a fraction of the global population, and they’re declining because communities are restricting their access to *garbage*. They eat it — which is why the Hudson Bay population grew as large as it did, as fast as it did. BTW, in Canada, polar bears aren’t considered threatened, they’re considered big game. Canada issues about 800 polar bear permits each year. Maybe yes, maybe no, maybe maybe. Polar bears hunt on the ice, but they’re not *reliant* on it, because they do quite well on dry land, too — they just change their hunting tactics. Polar bears are *not* stupid animals, or they wouldn’t have survived in the Arctic in the first place. If the Polar Bears are declining, I would be more inclined to look in the freezers of the native hunters living in the area. If not then where are the dead carcasses? Oh ya, they sunk in the open water. If they are near extinction, let Canadia know. It is my understanding they still sell hunting permits. With regard to polar bear numbers – last time I checked no one knew how many there were. Seems a useful start point? I see it clearly too. It is however not a different logical fallacy then the one in the AGW theory itself. I do hope I haven’t given it away with that. Just wanted to let you know that the polar bear image doesn’t link to a story on the faked image. Wait a minute.. 15,000 years ago, were we not still in an ice age? Why would the arctic be ice free? You do know that Rachel Carson supported the use of indoor residual spraying with DDT for public health uses don’t you? Good, I thought you did. I wouldn’t want you to engage in a display of ignorance that might otherwise damage your credibility. On what proxies is that graph of CO2 concentrations vs global temperature based? As with most global warming gobledee-gook (sp?) AGW alarmists are only telling one side of the polar bear story. If you ask the Inuit, who actually live WITH the polar bears, they say they are they ones in trouble, not the polar bears! Polar bears have survivied many ice-free acrtic summers in the past 5 million years of glaciations/inter-glaciations. That is too short of a time frame for them to have evolved the adaptations they have developed to survive -50 degreee Arctic living and to also have survived the interglacial warm periods (like the one we are currently expereincing). They simply change their habits, adapt, if you will, to become land hunters. “Wildlife adviser with Nunavut Tunngavik Inc., Paul Irngaut, has taken about 30 (bear hotline) calls in the past weeks. Who knew? computer simulations and models are predicting incorrect outcomes verses reality. Huh. “Actually the virtual extermination of peregrines (and many other birds) in parts of Europe and North America in the 1960′s by pesticide poisoning (DDT and mercury compounds) is very well documented and the physiological mechanisms are well understood. I was present when it happened and you could find droves of dying birds during sowing where mercury doped seeds were scattered about. Any number of birds and eggs were analysed and the connection between high quantities of DDE and/or organomercury compounds and the characteristic symptoms was verified by feeding experiments. Oops, combining organomercury and DDT and discussing sowing of seeds doesn’t work. Please provide the cited publications of the testing. I’ve been trying to find them for a research project and I’m not having any luck on the web. Since you were there, may we presume that you co-authored the same? If not, I’m sure you can provide the names of the authors. Polar bears are recent evolutionary responses, they found food in the arctic, moved north chasing a food source, seals they liked to eat and found easy to catch, and turned white to camouflage themselves better to hide from seals. So if they all die off, we can just make more, can’t we? Just ship brown bears north and let evolution fix the loss. I doubt most people realize how short polar bears have been on earth, given earth’s 4.5 billion year age. Polar Bears live well in ice free zoos all over the world. CO2 appears to be a lag indicator of temperature based on the ice core charts. It appears to hang around as temperature drops due to the rate of oceanic intake and lags temperature uptrends. Based on the link, there are periods when this doesn’t appear to follow the pattern indicating that something else was driving CO2. The something else is likely volcanic activity? And her science which over-hyped the result on humans in general had nothing to do with the ban at all? When you combine activism in science with politians, you get bad results, this should be a lesson to all. It didn’t matter that she said it was better to use DDT indoors or not, her work got the chemical banned. Best intentions of mice and men….often go astray. She should be blamed for the ban for using bad science showing a correlation between cancer and DDT. I don’t care what she thought or believed, its the results of her research that matter. Thats what matters. And yes, DDT has a detrimental impact on wildlife. This is why instead of over-hyping the impact on humans, the reality should be made crystal CLEAR to those in power because they do not understand what the science actually says versus what the scientists allude to that might be a possibility. Which brings us back to global warming. We have a reality disfunction here where scientists say “this is possible and is one possibility with this GCM.” Activists run with this and convince everyone that CO2 CAUSES the temperature to rise when the correlation is still being worked on. This is science at its infancy, we can not say how much of an impact CO2 has on the environment because all the science is filled with weasel words such as “could” and “possible”. Maybe the scientists did not say this, but they should be held accountable with their weasel words of “this is possible.” don’t put possibilities into scientific papers, put results and make it crystal clear without being a weasel. Thats the moral of the entire DDT story. And that should have been a lesson for scientists everywhere on how to not act. Don’t be a weasel monkey. Show your results for what they are and don’t sell your soul for more grant money. you are right of course but look at a typical headline in the MSM! Good question. This article addresses it and is as good an explanation as I’ve found for the Arctic being ice-free in the summer — which it *had* to be, based on the types of extinct animals they’ve found. It looks like the terrain and the *climate* in the Arctic during the Ice Age was not only much different than we thought, it may have been more different than we could imagine. It would be rather fun it it instead was all those enviromuppets research vessels, chopper and planes was the tipping point of all those government research, military, et cetera vessels, choppers, and planes, not to mention tourism, helping to break up the ice by plowing through the ice, and by vibration, and changing the landscape by buildings, thereby making it much easier for weather to finnish the job. March 2010 was a good month for them, perhaps aided by the ‘titanic’ effects of our exceptionally prolonged and cold winter. Hmm, so two things that appear to be true, but contradict each other, so both can’t be true. So either (a) polar bears don’t require summer sea ice to survive, or (b) the pre-historical record is not as true as sold. Actually, I’ll take (c), which is both of the above. I take any pre-historical scientific “facts” to be highly questionable because of the number of assumptions going into radiometric dating, and I also seriously doubt that polar bears can’t survive without summer sea ice. You realize that’s just a speculative story, right? According to the above article, polar bears and brown bears diverged only 150,000 years ago. Is that legitimate? Hard to say…assuming a generation of 10 years for polar bears (someone please correct me if that’s far off), that’s only 15,000 generations. Seems like a lot, but it’s not a whole lot to work with really…Lenski’s long-term evolution study has topped 50,000 generations with relatively large population sizes and hasn’t shown very much change. Thus, I’m finding it doubtful that all the above can be true. The divergence between brown bears and polar bears occurred in Southeast Alaska, likely near Admiralty Island. Genetically speaking, the brown bears of Admiralty are closer to polar bears than either are to any other species of bear, even though there are brown bears on the islands (Baranof and Chichagof) and mainland that surround Admiralty. Adult male bears eating cubs is not an issue of hunger, but a genetic strategy to increase the odds that their DNA survives and the other guys’ doesn’t. It’s a Darwinian sort of evolutionary strategy — survival of the fittest. It doesn’t always work out as planned when the boar nails one of its own, but there’s no way of him knowing that. The same behavior occurs with brown bears in Southeast Alaska and elsewhere. Polar bears have not been around 5 million years, rather not more than about 180,000. Much of the assemblage of modern higher mammal species is a product of the Pleistocene climate swings. The modern genera show up around 2.8 mya and the species more recently than that. Take your own species for example. Anatomically modern Homo sapiens begin to show up in the fossil record only about 180,000 years ago. There was something special about the period between 190,000 and 150,000 years ago that hasn’t been fully explored yet. It marks the time of radiation and speciation that appears in many marine mammal species (right whales, killer whales, Lagenorhynchus and Stenella dolphins) including the polar bear, as well as human beings. What about Greenland Bill? The ice-core samples have to be older than 15,000 years. Note: the ice-cores reflect volcanic events and temperature but the Vostok Ice-Cores are from Antarctica so they don’t reflect Arctic conditions. The Vostok Ice-Cores supposedly don’t contain effects of catastrophic geological changes like petroleum, vermin, weird Venus gasses, red snow, manna in amongst the layers. Also no evidence for rapid rotational changes in the earth, no floods, and no major asteroid bombardments. No idea why they might expect to find asteroid in the cores but I’m probably missing something. The logic is impeccable and unimpeachable regarding the Hudson Bay ice and polar bears. Therefore I shall use it. To wit: The warm phase of the Pacific Decadel Oscillation is a reliable predictor of low salmon populations. Therefore we should enact legislation to remove/reduce/control the cause of the warm phase of the PDO. The post above is the reason why I have remained sceptical of AGW. They need to explain the ice-free / co2 low and the ice-age / co2 ten times higher. As for the polar bear survival I have always maintained that polar bear have survived ice free / low ice extents in the past. They scavenge for goodness sake! R Gates, your foot will be vastly improved with a bit of seasoning and perhaps some ketchup? On 9/22/09 — in this post — I made a similar argument regarding polar bears having already survived one or more summers with zero Arctic sea ice. I am VERY happy to see the same argument made at WUWT (where a far larger audience will see the evidence). Polar bears are very intelligent and very adaptable creatures. They are doing just fine and they will continue to do so. How well Homo sapiens will survive eco-extremist political tyranny is more in question. I am always intrigued by graphs depicting eras, temps, and CO2. The oceanic currents and tectonic plates have quite an impact on both. I wish the graph had blow-out pictures of the estimated position of land masses and possible oceanic currents for each era. The graph would be vastly improved in terms of its informational content along with its data presentation. Good point. Who really knows and it’s somewhat irrelevant what happened in the past. So CO2 didn’t cause global warming in the past, but it does now, so we have to decarbonize our economy and raise a lot of taxes, well very good argument that is. Thanks for giving us an example of the strident adherence to logic that is all things AGW. was the arctic ice free during the medieval warming period, which was much warmer than today? was the arctic ice free during the roman warming period, which was even warmer than the medieval? The holocene optimum, even warmer yet? how about, was the arctic ice free during the eemian, which was so much warmer than the holocene that trees grew above the arctic circle, much of northern europe was under water, and hippos swam in the rhine? Instead, for now at least, the NOAA predicts COOLING at both poles this winter 2010/2011. Good article and it got me to thinking about the Arctic Basin. What would happen to Arctic if water was shut-off from the Bering Strait and the Arctic Ocean dropped 50-85m? RECENT climate records from ice cores and deep-sea sediments suggest that there has been considerable climate variability in the North Atlantic region over the past 250,000 years 1–3. Much of this variability may be linked to changes in thermohaline circulation in the North Atlantic ocean 4–6. Model studies 7–9 have demonstrated that changes in the flux of fresh water to the ocean, resulting from changes in atmospheric transport or the waxing and waning of ice sheets, can have a significant effect on the thermohaline circulation. Here we present model simulations showing that increased flow of fresher North Pacific water through the Bering Strait into the northern North Atlantic can also affect the thermohaline circulation, by suppressing North Atlantic Deep Water formation; however, decreased flow does not necessarily cause deep-water formation to begin again. In our model, flow through the Bering Strait depends on eustatic sea level and the salinity difference between the North Atlantic and North Pacific oceans. We suggest that the higher sea level during the last inter glacial period10, leading to greater flow through the Bering Strait, may have made the North Atlantic thermohaline circulation more sensitive than it is at present to fluctuations in the hydrological cycle, which may explain recent observations indicating that climate variability was greater then than it is today. Question for our bear experts : Do polar bears rely on summer ice , or do they just deal with it ? As for what happened thousands of years ago, maybe not all sea ice disappeared or the population became very small then flourished when Ice returned, ……..
You do realise that you agree that thousands of years ago there was less sea ice than today, yet today we have more co2? Does this not bother you in the slightest? The alarmists use polar bears beacause they look cute and cuddly. The truth is that they are voracious carnivores and will eat any protein including humans. They are a competitor species. I will not worry if polar bears vanish from the planet. There’s plenty of brown bears to replace them. The seals might vote in favour of polar bear extinction as well. So why do you worry about the Arctic so much? At best, it is only an indicator. We have no theory of climate change and cannot make serious predictions. Let’s just step back and see what happens and react to that. This implies that there is no long term correlation between CO2 and Arctic temperatures. Could you please direct me to who, anywhere, anywhen, actually said this? Or is this merely your interpretation of the current state of climate science? Again, no one is saying CO2 causes ice to melt. Let me clarify. CO2 is causing temperatures to rise. Rising temperatures will cause the ice to melt. It is, of course, possible to have higher CO2 levels and lower temperatures, as well as higher temperatures without higher CO2 levels. There are lots of factors in climate. The two are not inextricably and proportionally tied. If they were, kindergartners could do climate science. But it’s not nearly that simple. But from what we know, it’s pretty clear that increased CO2 levels here and now are warming and will continue to warm our planet to dangerous levels. The connection is not nearly as simplistic as you paint it, but I suspect you know that. … According to the above article, polar bears and brown bears diverged only 150,000 years ago. Is that legitimate? Hard to say…assuming a generation of 10 years for polar bears (someone please correct me if that’s far off), that’s only 15,000 generations. Seems like a lot, but it’s not a whole lot to work with really…Lenski’s long-term evolution study has topped 50,000 generations with relatively large population sizes and hasn’t shown very much change. Thus, I’m finding it doubtful that all the above can be true. I think you’ll find it’s a more selection effect than genetic evolution. The story would go something like this: Some of the bears had some white fur. Some had brown fur. The whiter bears found they could hunt better on ice or snowy terrain than the brown bears, who did better in the woods. So they moved apart. Some of the offspring of the white bears were brown and moved back to the old country (1/4 of them, if white fur is determined by a single recessive gene); some of them were pure white and moved out further onto the ice, becoming polar bears (1/4 again, on the same assumption). The genes are already there in the gene pool; they’re just diverging into different breeds. This takes only a very few generations (up to 1/2 of the white genes could separate out per generation). It’s not the bears’ colouring adapting to the climate; it’s the bears’ adapting by choosing their niche according to their colouring. Add the idea that weather patterns would logically change due the ice sheets and exposed Arctic Ocean evaporation and more activity in the Ring of Fire and Mid-Atlantic trench due to the change in ocean mass which inhibits submerged volcanic impact and we end up with a Rainforest in the Arctic? 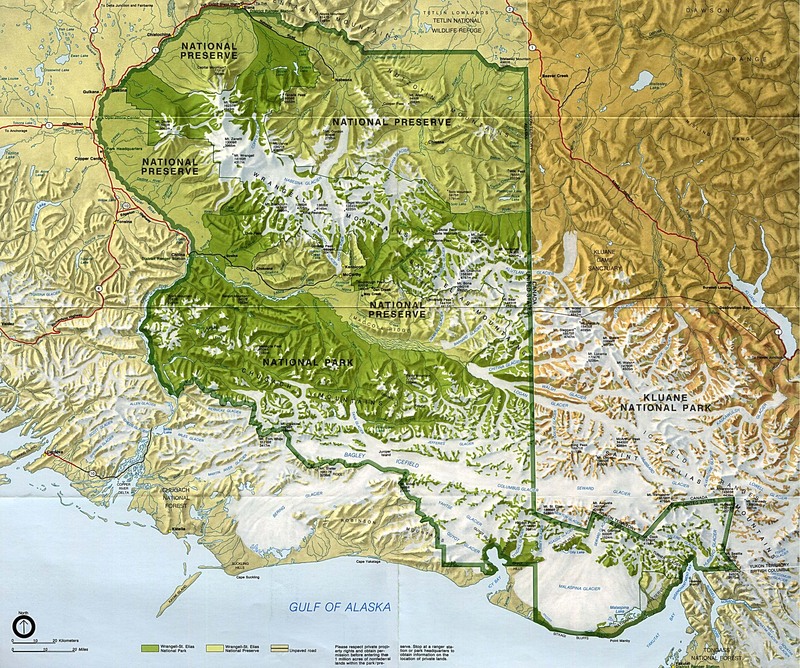 The Seward Alaska area is a rainforest today – why not further North? “Talbot says the evidence of a polar bear from 130,000 years ago shows that the creatures somehow survived conditions warmer than they face today. In the meantime, with co2 going up, we have had the last 2 septembers of Arctic ice extent growth compared to 2007. Kindly present your evidence (opinion will not suffice). Click here for overwhelming evidence to the contrary. What is clear is that temperature rise has been far below even Hansen’s most conservative forecast. To add to your nice piece on Polar Bears I wrote this article just over a year ago on the same topic. In the comments of it I hammer down an environmentalist point by bloody point slaughtering her the bears are doomed arguments. Enjoy. CAUTION: videos in the article depict graphic polar bear eating human violence. We are their food after all and it’s good to remember that bears are NOT our friends. Never approach bears, even ones in cages. They’d love a raw human steak for a snack. Dunno — I’m thinking the stuff trapped in the ice in Greenland would be more a measure of conditions within a few hundred miles. The article pretty much confined itself to the Siberian/Alaskan/Yukon steppe, and 1,500 miles is quite a ways for windblown pollen to travel. The land bridge across the Bering Straits resulting from the lower sea level would definitely block water from the Pacific and affect the Arctic, particularly the lowlands — remember the Sov proposal in the early ’60s to dam the straits? It was touted as a way to transform taiga, tundra, and muskeg into farmland by altering the salinity of the Arctic Ocean — theoretically, fresh water from the Yukon and Siberian watersheds wold float atop the salt water, freezing faster but melting sooner, thus allowing the Arctic Ocean to warm the land faster during spring and summer, and to slow the onset of winter. I wish the graph had blow-out pictures of the estimated position of land masses and possible oceanic currents for each era. The graph would be vastly improved in terms of its informational content along with its data presentation. No ocean currents but if you click on any era listed on the left hand side, estimated ocean coverage and plate positions are Illustrated. Trap some polar bears, and insert them into an area overpopulated with lots of prey, say Washington DC, like they did with the wolves they put into Yellowstone Park. Do not allow anyone to harm them in any way. This would test if they can survive a warmer climate, probably increase their population and possibly help with many of our other problems here in the good old US of A.
Ken Hall: I take issue with your differentiation between endangered and threatened. Granted the threatened classification is endangered light, but the law still requires the designation and protection of critical habitat and preparation of a recovery plan. These functions can result in highly restrictive limitations on land uses and activities. In this sense your note distinctions without any substantive differences. Happy to help out, I’m sure. However, I suspect that what you’ve done is to simply construct a straw man to help create your supposed logical fallacy, a common Warmist tactic. But that wouldn’t be teaching, really, but more along the line of indoctrination. And that would make you a Bad Professor. during the last glaciation, if the bering were closed and the northslope/siberia were not glaciated then prodigal amounts of fresh water would have been flowing into the arctic. Sorry, I drifted off topic thinking about the Mammoth puzzle. Check this map of the Arctic and imagine only the darker blues as possibly containing ice or salt water as the rest would have receded due to the drop in sea level. If this is what happened the exposed land would have been prime for new grasses and would catch fresh water run-off. And a little O/T but I couldn’t resist. With all the ‘humans are not a part of life’ propaganda in the Aussie media, this is a nice rebuttal of the eat less meat campaign. “… Solar energy reached a summer maximum (9% higher than at present) ca 11 ka ago and has been decreasing since then, primarily in response to the precession of the equinoxes. The extra energy elevated early Holocene summer temperatures throughout the Arctic 1-3° C above 20th century averages, enough to completely melt many small glaciers throughout the Arctic, although the Greenland Ice Sheet was only slightly smaller than at present. Early Holocene summer sea ice limits were substantially smaller than their 20th century average, and the flow of Atlantic water into the Arctic Ocean was substantially greater. As summer solar energy decreased in the second half of the Holocene, glaciers reestablished or advanced, sea ice expanded, and the flow of warm Atlantic water into the Arctic Ocean diminished. Late Holocene cooling reached its nadir during the Little Ice Age (about 1250-1850 AD), when sun-blocking volcanic eruptions and perhaps other causes added to the orbital cooling, allowing most Arctic glaciers to reach their maximum Holocene extent…..
OH! Oh! the Warmists are not going to like that statement. Where is Dr. Svalgaard??? Solar energy was just mentioned. That particular Abstract goes a long real well with this one for a late night horror story, especially if you do not think CO2 is raising the temp more than a degree if that. Looks like if the “climate scientists” screwed up the calculation of the “climate sensitivity” to CO2 and skeptics are correct, we could be in a world of hurt. Solar minimum, cool phase of the ocean oscillations and rumbling Russian and Icelandic Volcanoes. closer look at the map depths which start at about 200M makes this a lot less exciting in terms of exposed land. The polar bear and grizzly can cross breed. That means they did not diverge all that long ago. ….The Vostok Ice-Cores supposedly don’t contain effects of catastrophic geological changes like petroleum, vermin, weird Venus gasses, red snow, manna in amongst the layers. Also no evidence for rapid rotational changes in the earth, no floods, and no major asteroid bombardments. The differences in the Greenland and Vostok Ice-Cores could be because NH air does not get past the equator very easily. I guess the asteroids have us up north in their sights instead of NZ or OZ. Check this map of the Arctic and imagine only the darker blues as possibly containing ice or salt water as the rest would have receded due to the drop in sea level. Nice find — the detail beats the daylights out of the topo/hydro chart I have. Go to 100% for greater color resolution and look at the -50 meter line. That would have been the *minimum* extent of the dry land back then. If only shark DNA could talk. Imagine the the tales it could tell. Asteroids, volcanoes, ice ages, warm periods, more asteroids, etc. To clarify, yes, it is quite possible that polar bears survived an ice-free or near ice-free environment. Even in worst-case scenarios, there will still be ice in winter. In the high Arctic, along the north coast of Greenland and the Canadian Archipelago, ice-free periods may only be a few weeks. Polar bears in Hudson Bay already survive ice-free periods of about 4 weeks. So there certainly may be a small population that could survive, but in much reduced numbers and with a much reduced range. I would hardly call that a triumph for those that don’t accept the evidence for anthropogenic global warming. Nonetheless, I do agree that the polar bear issue is sometimes overblown. Losing polar bears from most of their already limited range would be tragic to those that care about nature, but there will be more important issues than polar bears. Having said that, I can understand the rationale for making them an “icon” of global warming. They are a characteristic megafauna that people can easily identify with – much more so than “less cute” creatures and other problems such as future drought, sea level rise, etc. It may not make sense, but people often make decisions, even correct decisions, as much on emotion as on reason and polar bears appeal to the emotions. 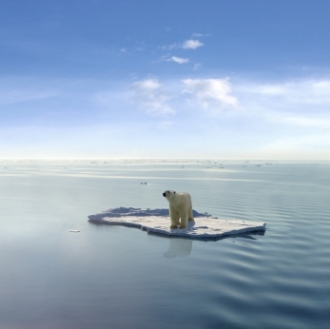 An ice free arctic means, Im sure you must agree, that polar bears must have moved onto land. 5000 and longer ago this would have caused no problem – no one lived in the arctic (The earliest inhabitants of North America’s central and eastern Arctic are referred to as the Arctic small tool tradition (AST) and existed circa 2500 BC – wiki). Today humans are not happy when polar bears take up residence in the back yard. If the swimming to find land does not kill them then the guns will! Its a great map. It looks to me like the area between the Kolyma River and the Indigirka River in the East Siberian Sea as well as some of the inlet areas in the and Laptev Sea and Kara Sea were exposed land. Interesting, these are also major fresh water inlets to the basin. Do you have any idea where they found the Mammoths and other grassland animal deposits in Siberia? There is just one small flaw in your argument. The “normal range” for Polar Bears is on land. Pack ice and (so-called) permanent ice are only “occasional” ranges. Click here for one of many substantiating sources. Mammoths have actually been found on the New Siberian Islands off the coast of Siberia north of Indigirka R. The Russians used to “mine” mammoth ivory there in the 18th and 19th centuries. In Siberia they are often found along meandering rivers where they are washed out. Your link suggests Polar Bears are at risk of extinction because of shrinking body fat. Shrinking body fat is merely a natural adaptation to warmer temperatures. Witness this image (taken from this page) documenting how zoo keepers in San Diego keep their Polar Bears thinner. If summertime Arctic ice melted completely (as it previously has), Polar Bears might find fewer (fat rich) seals. Okay, so they eat leaner foods, lose some body fat and adapt to warmer temperatures! No problem! As a reader noted, they’ve found both fossil and skeletal remains all over the place. I’ve gone looking for papers (and news releases) mentioning specific sites for *intact* mammoth discoveries and haven’t found any pattern other than the obvious one — near permanent and semipermanent human settlements. One that tickled me was the baby found in Yamal — conjured a vision of mammoths munching larches and messing up tree ring counts. More time in one area equals more time to explore and find out where that awful smell is coming from — people following dogs are usually the first ones to find thawing mammoths. I did some research last night and immediately found numerous articles related to Alaska finds including Mammoth in Fairbanks, central Alaska above Anchorage, and the Klondike region. Mastodon was also mentioned but the finds are relatively rare. I also ran across a map of human settlements dating 8,000 years ago across Alaska and the Aleutian Islands. One appears to be on Kodiak Island. I guess the first issue is plate movement at the Bering Strait in an attempt to confirm the depth and composition of the channel bed over the last 20,000 years. I suspect there are a number of papers out there – the physical limitations of the strait during glacial sea level drop and potential impact on the Arctic Ocean and climate is to obvious to have gone unnoticed. Finding ice core sample findings from glaciers in the Bering Strait area would confirm volcanic activity. Begs a question: Why do we go to the remotest parts of the world and assume its representative of global conditions? There aren’t any currents or volcanoes near the Antarctic ice-core samples. There were also many reports in the 1970s that American Bison would be extinct by 1980. But things change. This year Hudson Bay melted early, last year it didn’t. And Hudson Bay is only a small percentage of the total bear population. Um, so doesn’t this mean they’re the same species? Assuming the offspring can reproduce that is. I realize that some areas of science like to change the definition of species to fit their agenda, but that’s the definition I was taught in high school. Related to the amount of water Mammoths need and their presence in Alaska, the floor of Alaska would have been warmer and wetter than the glacial and snow covered peaks. As the warm air rises over the colder peaks it condenses which would have created a significant amount of run-off and snow. Yet, Siberia and northern Alaska like Prudhoe Bay and the town of Barrow have 2-3 months of darkness each year. I can’t imagine Mammoth’s huddle together for 2-3 months a year like Penguins. Who knows, maybe they did making them easy prey for crazy cave men running around in subzero temps and the snow. Here are some [current] average annual precipitation and snowfall totals for a cross section of Alaska. Curious, it takes a lot of snow pack to make an inch of glacial ice. A very curious puzzle given Mammoth tusks found 130 miles inside of the arctic circle and mined from islands off the Siberian coast. Sorry, Beringia doesn’t look logical given the geologic formations on the floor of the Arctic basin and the tectonic plates don’t appear to support the idea within the timeframe mentioned. “Well documented” indeed. So what totally falsified hypothesis or theory in history, accepted, nay, insisted upon by a great majority of natural philosophers or scientists has not been well documented? I can’t think of a single one. Nowadays, peer review controls the documentation process. If a document hasn’t approval of s small group of the elite, it isn’t considered to be documentation. Peer review is no more than defending the faith, whatever the faith of the elite is at the time. “The electric current can not be subdivided.” That it could not be was well documented. It took no “scientific” peer reviewed paper to falsify it, and the man who demonstrated to the world that it was a false theory had no more than an 8th grade formal education. And given the prevailing winds, most of it would land in the mountains *and* to the south, feeding the growing ice cap. Make sense? Yet, Siberia and northern Alaska like Prudhoe Bay and the town of Barrow have 2-3 months of darkness each year. I can’t imagine Mammoth’s huddle together for 2-3 months a year like Penguins. Or they may have adapted to a semi-nocturnal lifestyle. Or, given the ice cap as a backscatter mechanism for the winter sunlight further south, the “night” would have been more like a deep twilight for twelve hours a day. Hu and his colleagues set out to solve a key mystery of the last glacial period: Why, starting about 116,000 years ago, did northern ice sheets repeatedly advance and retreat for about the next 70,000 years? The enormous ice sheets held so much water that sea levels rose and dropped by as much as about 100 feet (30 meters) during these intervals. Using the NCAR-based Community Climate System Model, a powerful computer tool for studying worldwide climate, the researchers compared the responses of ice age climate to conditions in the Bering Strait. They ran the model on new supercomputers at NCAR and the Department of Energy’s Oak Ridge National Laboratory, enabling them to focus on smaller-scale geographic features that, until recently, could not be captured in long-term simulations of global climate. The simulations accounted for the changes in sea level, revealing a recurring pattern-each time playing out over several thousand years-in which the reopening and closing of the strait had a far-reaching impact on ocean currents and ice sheets. • As the climate cooled because of changes in Earth’s orbit, northern ice sheets expanded. This caused sea levels to drop worldwide, forming a land bridge from Asia to North America and nearly closing the Bering Strait. • With the flow of relatively fresh water from the Pacific to the Atlantic choked off, the Atlantic grew more saline. The saltier and heavier water led to an intensification of the Atlantic’s meridional overturning circulation, a current of rising and sinking water that, like a conveyor belt, pumps warmer water northward from the tropics. • This circulation warmed Greenland and parts of North America by about 3 degrees Fahrenheit (1.5 degrees Celsius)-enough to reverse the advance of ice sheets in those regions and reduce their height by almost 400 feet (112 meters) every thousand years. Although the Pacific cooled by an equivalent amount, it did not have vast ice sheets that could be affected by the change in climate. • Over thousands of years, the Greenland and North American ice sheets melted enough to raise sea levels and reopen the Bering Strait. • The new inflow of fresher water from the Pacific weakened the meridional overturning circulation, allowing North America and Greenland to cool over time. The ice sheets resumed their advance, sea levels dropped, the Bering Strait again mostly closed, and the entire cycle was repeated. The combination of the ocean circulation and the size of the ice sheets-which exerted a cooling effect by reflecting sunlight back into space-affected climate throughout the world. The computer simulations showed that North America and Eurasia warmed significantly during the times when the Bering Strait was open, with the tropical and subtropical Indian and Pacific Oceans, as well as Antarctica, warming slightly. The study refers to a 100 foot drop (30m). The Bering Strait is currently 49m at its deepest point. I’ve seen different accounts related to the sea level drop but the range was 85-120m at the last glacial minimum. I wonder if they used the 30-35m drop reported to be the level at the end of the last glacial which would have opened flow into the Strait by 14-19m. Also, Bill Tuttle’s comments about the fresh water impact seems to conflict with the salinity theory. I’ve seen different accounts related to the sea level drop but the range was 85-120m at the last glacial maximum. The abstract is restricted under copyright so here’s my take. – factors related to Meltwater Pulse (MWP) are under review by field scientists and modelers. To be honest, I think there is a whole lot more here then meets the eye. For instance, if the sea level drop was greater than 100m, most of the Siberian Shelf would have been above sea level. It’s the widest continental shelf in the world extending 1,200 kilometers offshore. But it would have been one big salty beach – its largely sandbar and silt. So, it was probably an all-night Mammoth Beach Party until the crazy cave men showed up. But it would have been one big salty beach – its largely sandbar and silt. A lot of the silt has accumulated from runoff since the glaciers melted, but *at the time*, it probably would have been a pretty interesting area. Salt would have leached downward through the sand after a few seasons, and topsoil would have collected in the lower areas, allowing tree seedlings to take root (all of southern New Jersey is sand overlying granite, with shallow areas of topsoil) and dune grasses would have stabilized the areas where the topsoil couldn’t collect. Think prairie, with “islands” of small trees and shrubs. I was amazed by the speed at which nature reclaims the land exposed by receding ice. Admittedly, the spot where I was observing the habitat was under the ice which carved the Glacial Basin but, even at the glacial maximum about 8 degrees C below current average temperature (-46.4 degree Fahrenheit) the mode of action should have been similar. Yet at the glacial minimum, a gross estimate indicates temperature in Fairbanks was always below freezing. Mammoth are found and date to the time frame. There are so many problems with an attempt to reconstruct what was actually occurring. What was the actual depth of the Bering Strait, the depth of the shelfs in the Arctic Basin, the actual temperature given the reduction in current and increase of fresh water in the arctic, volcanic activity in the Ring of Fire and possibly on the floor of the Arctic Basin due to plate changes over the 10,000-20,000 year time frame. With the Bering Strait cut off and a sea level drop of 100m+, the Alaska Gyre must have been a massive snow maker closer to the Strait. Or Not solve them, its quite a puzzle. Sorry really messed up the Fairbanks temperature conversion in my last post. Assuming an annual mean maximum temperature of 40 degrees F, which is appears to be above the 1900-2000 mean, 40F = 4.45C -8C = -3.55C or 25.61 degrees Fahrenheit at the Last Glacial Maximum approximately 20,000 years ago. The -8C is the worst case based on the Antarctic ice-cores. This is all absurd without temperature related ice-core data from the glaciers in Alaska. I was amazed when I read about the field research that went into COHMAP and CLIMAP and found my way to PMIP 2. The other interesting footnote so far is the disagreement on Pacific SST with IPCC models from the last glacial era. IPCC appears to use much colder values.